A huge 10-storey glass airport terminal is being built in Singapore's Changi airport, which will boast the world’s tallest indoor waterfall, a large indoor park, walking trails, apart from improved facilities for passengers, reports 'DailyMail'. Called 'Project Jewel', the £726million terminal that is scheduled to open in 2018, will have five storeys above ground and five below ground, with a total footprint of more than 1.4 million square feet. 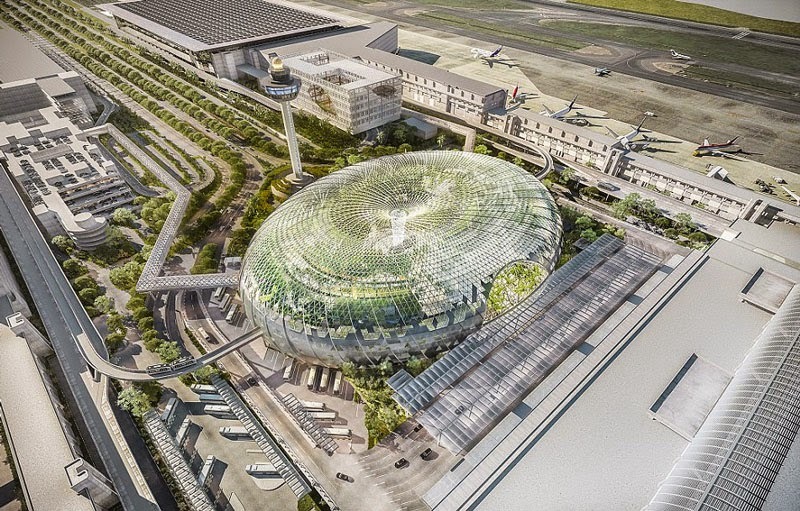 The round-shaped terminal will house one of the largest indoor collections of plants in Singapore and one of its top attractions will be Forest Valley, a huge five-storey garden filled with thousands of trees, plants, ferns and shrubs. And a breathtaking 130-ft ‘Rain Vortex’ is expected to be the world’s tallest indoor waterfall once complete. For travellers, Jewel will be an exciting tourist destination. For Singaporeans, it will be a playground near home, the report added. Located at the core of the complex, it will transform into a light and sound show with special lighting effects at night. Jewel will seamlessly integrate with Terminal 1’s arrival hall and enhance facilities for faster check-ins and luggage drops, as well. It is designed by a team led by world-renowned architect Moshe Safdie and is a joint venture between Changi Airport Group and CapitaMalls Asia. Changi Airport was named the world’s best airport in 2014 by the World Airport Awards.